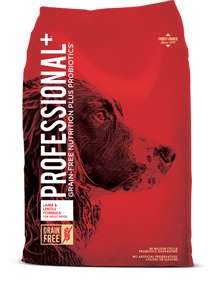 Every bag of Professional+ dog food is a complete health system, backed by science. Made with the highest quality ingredients, each formula is scientifically proven to meet the nutritional needs of your pet. 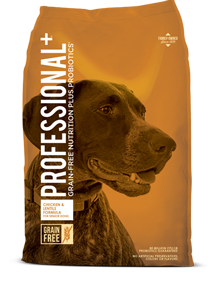 Professional+ is enhanced with probiotics to help support the immune and digestive systems and contains precise levels of real chicken [or lamb] protein, fat and nutrients. Every ingredient in Professional+ has a purpose. Click the plus signs to learn more about the benefits of each ingredient. Every ingredient in Professional+ has a purpose. Click the plus signs to learn more about the benefits of each ingredient. Provide quality carbohydrates, taste great and are great alternatives to grains. Some dogs are sensitive to grains. So, no grains. Beneficial bacteria that help balance bad bacteria and support the GI and immune systems. Our proprietary probiotics are derived from strains naturally found in the cane GI tract and added after the cooking process to guarantee viability. As in 100% real chicken or real lamb. No confined living spaces or by-product meals. Provide omega fatty acids. Vital for healthy skin and a shiny coat. Provide fiber. Help support healthy digestion and the elimination of waste. Essential for proper brain and vision development in puppies. Important for pregnant or nursing mothers as well. Powerful antioxidants. Help support the immune system. Help support joints and the cartilage between them. Exceptional pets deserve no-nonsense nutrition. But your dog doesn’t have to be a professional to benefit from premium ingredients. 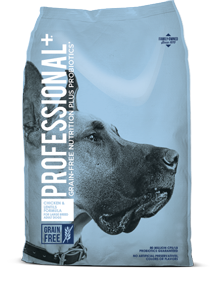 Professional+ delivers complete, grain-free nutrition at an affordable price, without compromising on quality. No artificial preservatives, colors or flavors. Nothing but honest ingredients with a purpose. 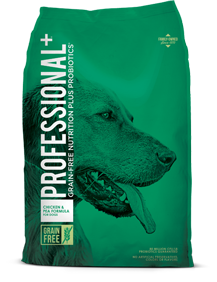 Professional+ is part of the Diamond Pet Foods family of brands. Diamond Pet Foods was born in 1970 as the result of one family’s commitment to the idea that every pet deserves the very best. From scientific solutions to holistic nourishment, we promise you that every product we produce is made using exceptional ingredients and delivers tasty, wholesome nutrition at a value you can appreciate. To learn more about these processes and Diamond Pet Foods, visit DiamondPetCompany.com. Get an inside look at what goes into creating quality products. Watch the video below for a tour of one of our state-of-the-art facilities. At Diamond, we only make products that we'd be proud to feed to our own pets. Nothing is more important to us than the safety of our products. We adhere to stringent and scientifically advanced food safety protocols and constantly monitor and test our raw materials, production environment, processes and finished products. By continuously improving performance with the latest advancements in science and technology, we've developed a comprehensive food safety system. Here are a few of the ways we ensure quality. To explore more about each of our formulas, click on the bags below. ARE THERE ANY NEW INGREDIENTS IN THE CHICKEN & LENTILS FORMULA FOR LARGE BREED DOGS? Yes, we added premium ingredients, including lentils and sweet potatoes, to replace the grains that were in the previous formula. Typically, dogs that weigh more than 50-55 lbs. are considered large breed dogs. Dogs will often “graze” as a normal behavior. If dogs are graze to the point that they vomit, you should contact your veterinarian. Your pet might be suffering from an upset stomach. ARE PROBIOTICS SAFE FOR PETS? Yes, the probiotics are processed under strict quality and safety standards. Each strain is purified and guaranteed to be free of harmful pathogens or other contaminants. WHAT ARE K9 STRAIN® PROBIOTICS? K9 Strain® Probiotics, developed by Diamond Pet Foods for their canine formulas, are derived from bacteria strains naturally found in the canine GI tract and are proven to survive in your dog’s system. WHY IS THE FOOD ONLY AVAILABLE IN ONE SIZE BAG? In order to best serve our customers, we have chosen a 28lb bag for the Professional+ formulas. We have found this bag size is most convenient for pet owners who have a variety of different sized dogs. To maintain our promise of quality nutrition at an affordable price, we have selected one conveniently sized bag with an amount that will meet the needs of any sized dog. Thank you for your interest in Professional+ Pet Foods. If you have questions or comments about pet nutrition or one of our products, or if you would like to join our mailing list or become a retailer, contact us using the forms below. You may also call us at 800-977-8797.